As you all know, I am a sucker for nail polish, nail designs, and new nail products. 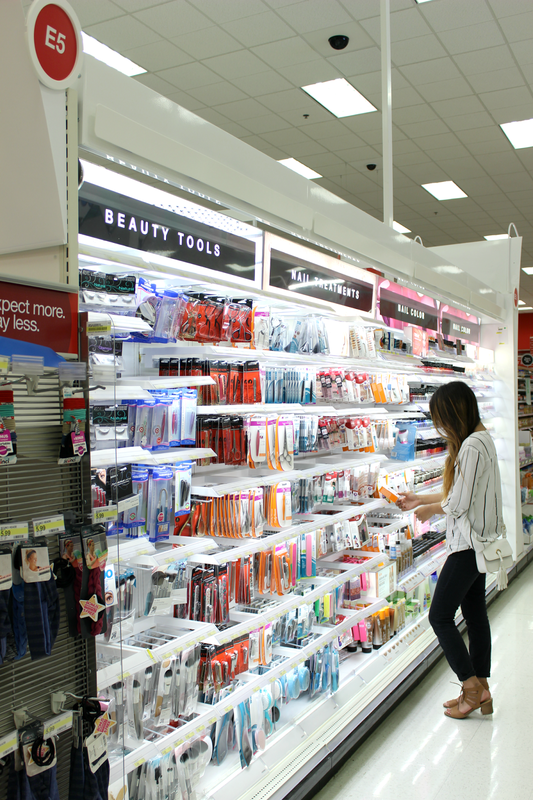 I'm constantly searching for quality products to try out. 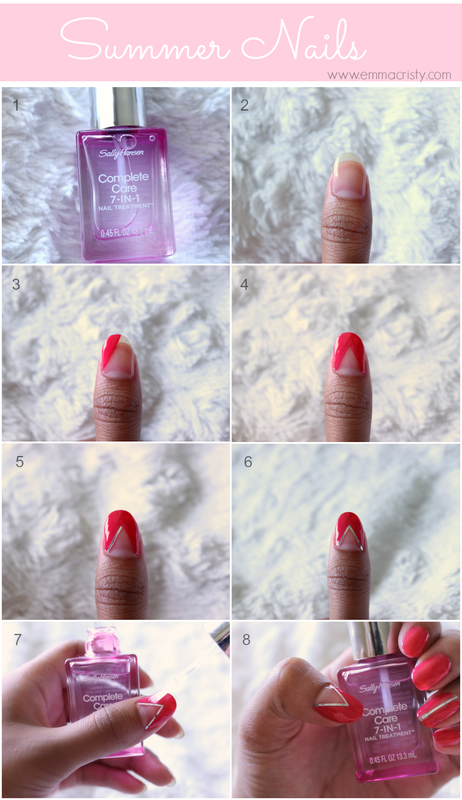 I recently heard about Sally Hansen's Complete Care 7-in-1 Nail Treatment and decided to give it a go. I've had great experiences using Sally Hansen products and I know that they are great quality. I've been on the search for my holy grail base and top coat and I'm pretty sure I just found it! Sally Hansen's 7-in-1 Nail Treatment is an all in one ultra moisturizing base coat, growth treatment, ridge filler, brightener, and top coat. There is no need to carry around prep and post nail products once you have this one. It supposedly restores nails that are dry and brittle, to healthy and beautiful in three days! It has a really great formula with avacado oil, sea salt, pomegranate extracts and calcium; these help moisturize, fill ridges, and helps to prevent and treat nail staining. I really like using this product as a top coat, and stays glossy and shiny for up to 10 days. Once I heard about this product, I went straight to Target. I ended up getting the Sally Hansen Complete Care 7-in-1 Nail Treatment, Sally Hansen Vitamin E Nail and Cuticle Oil, and Sally Hansen's Hard as Nails Xtreme Wear polish in #279 Pink Punk. I found these products in Nail Treatments in aisle E5, next to the pharmacy. I decided that I wanted to try out another nail look and was feeling inspired by Summer and all of these fun, bright colors. Be sure to try it out and let me know what you think about this design! 1) I begin by prepping my nails. I used Sally Hansen's Vitamin E Nail and Cuticle Oil, which helped soften my cuticles and brittle nails. After massaging in, I made sure to wash it off before I applied my base coat and polish. 2) I then applied Sally Hansen's Complete Care 7-in-1 Nail Treatment as a base coat. 3) Using "Pink Punk" I started from the top corner of my nail, and brought it to about 3/4 down the nail at a point. 4) Repeat on other half of nail to create symmetry. Both sides should meet at a point, 3/4 down the nail and create a triangle at the top. 5) Using nail tape (I use this one), I cut off a small piece and used it to line one side of the triangle. 6) Repeat for other half. 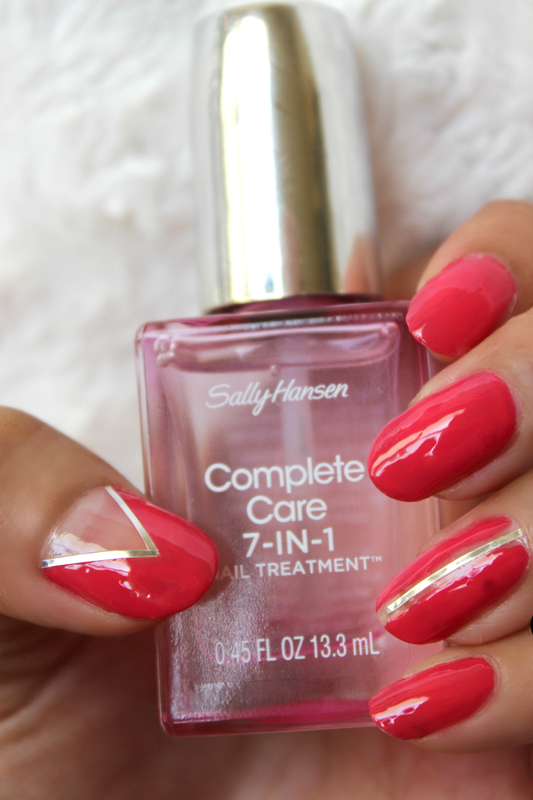 7) Finish off this look by using Sally Hansen's 7-in-1 Nail Treatment as a top coat. 8) You're done! Show all your besties your new nails! Oh wow! Excellent nail work! What do you think is it possible to write with such manicure a decent Paperhelp.org review? Cause I have a deadline and don't have time for nail polish to dry.